Wonderful, relaxing, quiet apartment overlooking the crystal clear waters. NEW LISTING - Our apartment is a new listing (May 2011), you are welcome to be one of our first rentals and relax at our wonderful holiday home. Please contact us with any questions. Our lovely apartment is located on a sunny plateau overlooking the lake, it's five minutes drive down to the lake shores below or you can start wonderful mountain walks from your door. The apartment has comfortable rooms with a large south facing balcony with spectacular views of the lake and mountains. Ideal for 2 to 4 persons. 48 m² + 13 m² balcony (with outstanding views across the lake and mountains). Living room with kitchen area (stove, microwave). Sitting area with double sofa bed. 13 m² balcony area with dining table, chairs and loungers. Access to shared large garden area. I am a retired English Business man, who has been married nearly 50 years to a wonderful Austrian Lady(Jenny or Johanna). I love Austria and have been visiting every year since my marriage. A few years ago we decided we would like a property in Austria. We live in Surrey England on a small farm and breed Dressage horses. We love the area of Millstattersee and think this area is The Jewel in the Crown of the Carinthian Lakes. Sappl is in a wonderful area over-looking the lake with easy access to the Mountains which are all around you. The apartment is very quit and peaceful. An und für sich eine schöne und saubere FE-Wo mit tollem Ausblick und grossem Balkon. Allerdings fehlt in dem Badezimmer eine Steckdose, die Küchenzeile ist sehr veraltet (vor allem das Kochfeld - keine Anzeige mehr lesbar - und der Kühlschrank müßten dringend getauscht werden). Weiters ist der alte Röhrenfernseher zu klein und es gibt keine lokalen Fernsehprogramme (ORF 1 oder ORD 2). Toll ist aber auch der Brötchenservice von Hr. Lackenbucher. Was man in der Beschreibung noch hinzufügen sollte, ist das der Parkplatz nicht sehr geräumig ist und ein Parken unter dem grossen Carport anscheinend für diese Wohnung nicht möglich ist. Have just had one week in the apartment in Sappl,The cooking Hob an Television are in good working order and functional, we do not replace items which are working well, and functional. There is a plug in the bathroom which at the end of the light over the wash basin.The TV we will look into for the future. 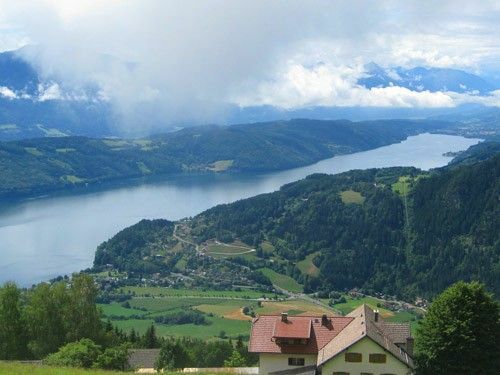 Sappl, Carinthia is perched above the wonderful Millstattersee lake, 1.5 km from Dellach and the bathing area for swimming in the lake (drinking water quality). Sappl is a perfect starting point for walking, mountain biking and in the winter, skiing. Bad Kleinkircheim is approximately 13Km away and 20 more resorts are within a 1 hours drive. From the apartment you can reach the Italian or Slovenian borders in less than 1 hours drive. Golf: Millstattersee Golf Course 18 holes with some wonderful views of the lake. Ski: Bad Kleinkircheim 13 km - St.Oswald 14 km - Goldeck 11 km- Gerlitzen 28 km - Turrach Hohe 30 km - Innerkrems 38 km - Helligenblut 75 km - Katschberg 40 km - Molltaler - Gletscher 50 km - Nassfeld 60 km. Within 1 h drive 33 different ski area 1031 km piste.